Fazaia Housing Scheme belongs to Pakistan Air Force (PAF) and it has developed major housing schemes for its employees as well as general public in Islamabad/Rawalpindi, Tarnol and Lahore already keeping in view the increasing housing requirements and modern housing development standards. Fazaia has already launched a project recently in Gujranwala and another project in Lahore by the name of Fazaia Enclave Lahore and now it is coming with a big bang to Karachi, the largest city of Pakistan. 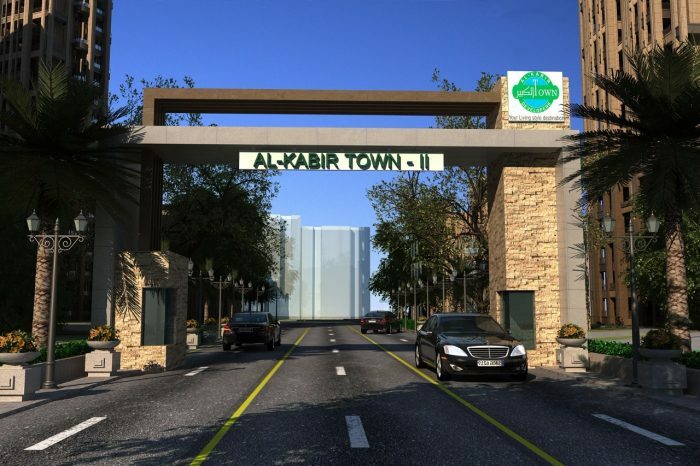 Exact details on the location of this project are still not available, however it is expected to be located somewhere in Malir Cantt. and most probably it is launching 2 and 3 bedroom standard and luxury apartments at very economical prices on installments. According to some other sources, this project will be located somewhere near Dream World on Super Highway near Bahria Town Karachi, however there is still no clarity about the exact location until it is disclosed by PAF Fazaia. Registration forms have been traded in the market by few dealers for last couple of days but these forms are not endorsed by the Management of Fazaia Society. So, it is better to wait until the project is officially announced and application forms are made available through proper channels i.e. banks & specified booking offices. Fazaia Housing Scheme Karachi seems to have followed the pattern of Bahria Town and announced its registration forms which are hardly available through proper channels i.e. nominated branches of HBL bank and PAF Fazaia Office in Karachi. Since it was Saturday, most of the bank branches were off, however it is expected to be available on Monday in the nominated branches of HBL bank across the country. Same forms had been selling in the black market but prices have dropped after it is confirmed that these forms will be available in the banks, so it is better to wait until Monday rather than paying extra money for these registration forms. Fazaia has disclosed its plan to build standard and luxury apartments in Karachi for PAF employees. Many people were expecting that PAF Fazaia will launch a proper housing scheme where general public will be able to buy plots but the actual plan of luxury and standards apartments has come out now. No exact details of location, sizes and prices of these apartments are available yet. 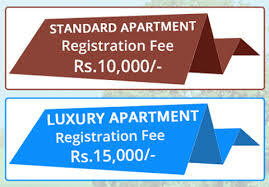 Registration fees for standards apartments is Rs 10,000/- and for luxury apartments is Rs 15,000/-. Registration forms can be obtained at original price of Rs 1000/- or if unavailable, can be obtained from black market at variable prices. Only registered members will be eligible to apply for booking in the project, so it is a must to get registered first. Form price is non-refundable, however registration fees is refundable in case you fail in the balloting. Planning and construction commensurate to highest quality standards. Strong and efficient security system comprising highly trained and equipped personnel; CCTV surveillance. After completion of the project, its institutional management, administration and maintenance will remain with PAF. Since the project has received massive appreciation across the country, especially in large cities of Pakistan as well as speculators, there is huge possibility of prices going very high in a short span of time. According to the feedback received from various cities including Karachi, Lahore, Rawalpindi and Islamabad, there were thousands of people gathered outside the nominated HBL branches but banks were unable to control the mob. There were few events of scuffle and also few people damaged property of the banks which caused some branches to close down. Black Marketing was going on at full swing as many people found it convenient to pay some extra money to avoid the hassle of long queues. Forms originally issued at Rs 1000/- were selling at up to Rs 20,000/- per form and people had to buy. These forms can still be obtained from the banks but banks should manage the crowd properly and assign extra staff to tackle the number of people coming for registration, otherwise it will help black marketers to increase prices and general public will have no other option but to buy from open market. A price list and payment plan of these apartments is floating on the web but the source is unauthentic and this is not endorsed by PAF Fazaia. Forms are now available only in PAF Museum since there have been several unpleasant incidents due to the crowd outside bank branches, so PAF has decided not to issue any form through HBL branches. Registration forms can be submitted to all branches of HBL across the country. Last date of submission is 26th March 2015. This video doesn’t disclose anything specific about the project i.e. location, apartment types or prices. Still, immense advertisement and limited availability is causing its demand to rise, hence creating hype in the property market across the country and pushing the prices gradually upwards. 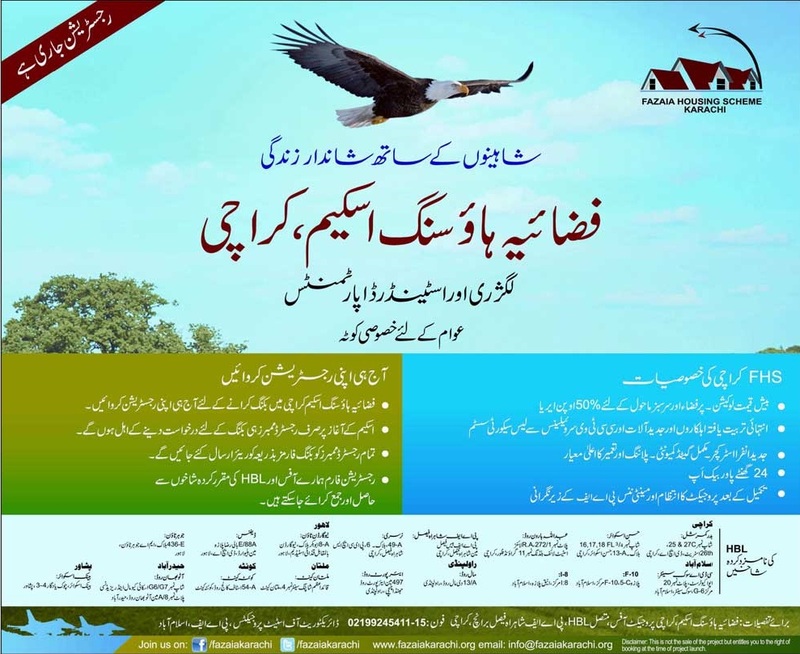 Fazaia Housing Scheme Karachi has announced the last date for submission of registration forms through newspaper advertisement. The last date is 26th march 2015, so hurry up and submit your forms to any branch of HBL near your home. Moreover, Fazaia has announced that they have given out the entire stock of registration forms to general public and no further forms are available. So, if you are still unable to find registration form, you have no other option but to buy from open market. As there is about a week left until the registration closes, price of these registration forms is expected to go much higher. If you are looking forward to buying a form for yourself or investment, here is your short term investment opportunity to grab as many form as you can and sell at profit since this project is getting overwhelming response from general public across the country. There are strong chances that FAKE REGISTRATION FORMS may be sold in the market, so you have to be very careful while purchasing. Especially, you have to check the form and know the person/agency you are buying from.